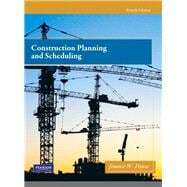 Construction Planning and Scheduling, Fourth Editionoffers broad coverage of all major scheduling subjects. This comprehensive resource is designed for construction management, planning and scheduling. It follows a logical progression, introducing precedence diagramming early and following with chapters on activity durations, resource allocations, network schedules, and more. It reflects current trends in scheduling (short-interval scheduling, computer scheduling, linear scheduling etc.) and includes chapters on arrow diagramming and PERT. With an eye on application, it includes a unique discussion of contract provisions related to scheduling and incorporates a sample project throughout.